As I mastered making delicious desserts more than ten years ago, I decided to take things to the next level. That’s how I enrolled in a fruit carving class in our town. Years went by, and this activity became very popular in my neighborhood. You should know, we are pretty much the community of foodies. So, every year we organize Cooking Olympics which contains disciplines appropriate for all generations. One of those disciplines is dessert decoration. This may come as a surprise to you, but my hubby and my boys are very passionate about winning this competition. They are not just my supporters, but committed participants! What started as an activity I engaged for my own pleasure became a family tradition! As the Olympics are approaching, we are in the hunt for the perfect fruit carving tools! The first one we’ll need is the apple peeler. We took the five most promising ones and tried them out before our final purchase. I am now sharing my experiences with you because I hope there are more dedicated dessert decorators out there and I know how meaningful and valuable this type of reviews can be. How Does Apple Peeler Work? What to Look For in An Apple Peeler? While professional fruit carving masters use more precise tools such as Thai peeling knives and peel zesters, apple peeler is good enough for us this time. We are entering the amateur contest where speed of carving is valued equally as the final fruit design. The main reason we are using apple peeler in fruit carving purposes is the simplicity and speed of its usage. An apple peeler is a tool used for removing the outer skin of an apple, by trimming it. This device usually removes the core too and offers the slicing option. It is originally designed for peeling apples, but it works on some other fruits and vegetables such as potatoes, pears, cucumbers, carrots, and beetroots. First apple peelers with cast-iron gears and sharp prongs appeared between 1803 and 1910 in America. It was a critical invention for the 19th century because almost every American household grew apples back then, each producing up to two tons of fruit every season. This means, enormous amounts of apples needed to be peeled, cored and sliced. Mechanical apple peelers made this process much simpler and faster! Two antique designs have been carried forward to the modern time – the lathe and the turntable design. However, the lathe design is the most common today, and majority of the apple peelers we tried are based on it. Apple peelers of lathe design have three blades – the corer, the slicer built into its side and the peeler. Each of these blades is usually removable or adjustable for added uses. Apple is placed on a threaded rod and then hand-cranked past a peeling blade. Cranking the rod spins the apple and steadily moves it forward. The peeling blade has a depth stop mechanism which prevents it from cutting in too deep. This blade is spring-loaded against the fruit and that way, it trims the skin away. The corer is a ring-shaped blade which cuts the core out while slicer stands in vertical position and slices the apple into a spiral as it spins forward. 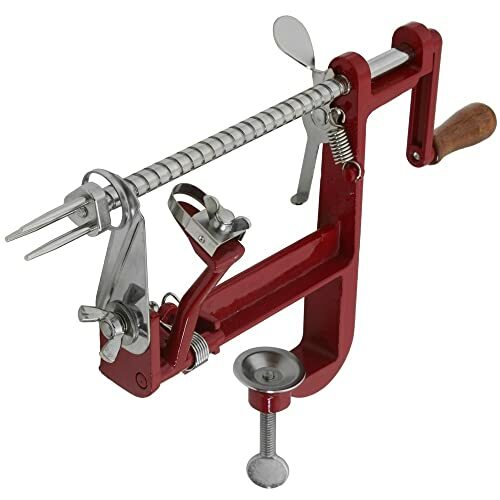 When you are buying an apple peeler for yourself, whether for the purpose of fruit carving or simple pie making, there are some aspects you should look for. The whole point of using an apple peeler is simplicity and speed of the entire process. So, you should abide by the product that is easy to handle without any help from your husband or anyone who has more strength. Even kids should be able to operate the peeler. It should peel the fruit quickly! Safety is one of the most important aspects. You want to prevent any type of injuries, which is why the device should be stable and not slippery. It should maintain its stability no matter the surface it is placed on or the product it is used on. It should be able to skin apples of any size and shape because they are not all the same. Further, it should be able to peel fruits and vegetables other than apples. However, even if it does peel other fruits and vegetables, you should be aware of peelers limited function, so it should be relatively cheap. And last but not the least, your device should be easy to maintain. This means you are looking for a gadget that is easy to clean, doesn’t rust, it's easy to store and to set up. Of course, manufacturer’s warranty would be a huge plus. All of these characteristics are pretty hard to determine if you haven’t used the product yourself. 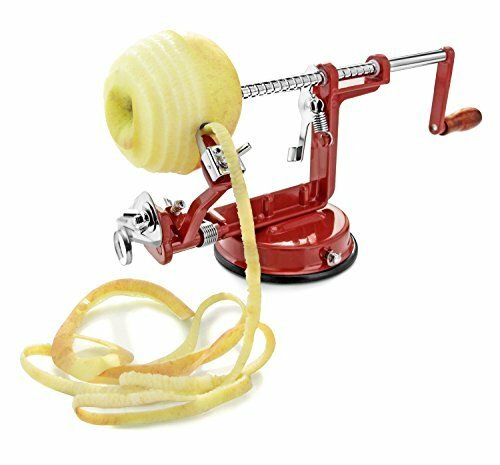 So, I strongly recommend you read the apple peeler reviews before buying, listen to your friend’s advice or take someone’s peeler for a ride. You wouldn’t want to end up with expensive and inefficient one only because you haven’t done your research. Using the apple peeler is pretty simple, which you can conclude from “How does apple peeler work?” section. You stick the apple on to the rod and crank. That’s the whole process. Also, the device usually comes with the instruction manual, so you shouldn’t worry about handling it. 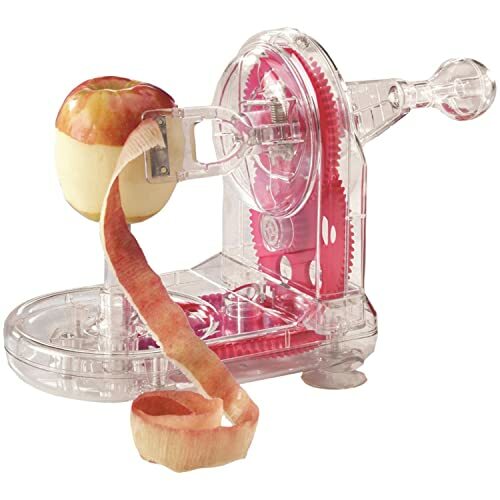 Spiralizer’s apple peeler is made of die-cast magnesium which means it is supposed to be stable and strong. It has a powerful rubber vacuum base that holds onto the tabletop. This vacuum base is the most questionable thing about it. It holds firmly, but if the surface gets wet the base slackens, and the device starts to slip. Also, it can’t be suctioned on wooden surfaces, which is a big problem for me, because the place where Cooking Olympics are held offers only wooden tables. Besides that, this apple peeler is easy to set up and clean. It is pretty small so packing and storing it shouldn’t be a problem. The peeling blade is adjustable, but even after I have adjusted it, I still had a feeling that it wastes more apple meat than it should. Whether you are fruit carving or making a pie, you would want as much fruit meat saved as possible. For the value of money, you’ll get a solid product with a few flaws and an option to return it for the full refund. In my opinion, you could do better for the same or even smaller amount of money. The money you pay for VICTORIO’s Johnny apple peeler will get you the solid construction, cast iron body, and stainless steel blades. Also, you’ll get a five-year manufacturer’s warranty which is great, especially if you plan on using this peeler excessively. However, this is another model that has a suction base, which means it can be placed only on dry and very flat surfaces. It is easy to clean, and it peels, cores and slices an apple in about fifteen seconds. If you plan on using it for fruits and vegetables of various sizes and firmness, you won’t be satisfied. It works perfectly only on round, small and medium apples. Large and soft apples create a problem while peeling a potato is almost impossible. Watch out if you are purchasing this model because there are low-quality knock-offs, which look almost exactly like the originals. The only difference is that original VICTORIO product is made in Taiwan, while these cheap copies are made in China. If the device brakes or the handle falls off, you probably ended up with the fake product. Read the instructions, they are well-written and assembling the peeler without them can be hard. 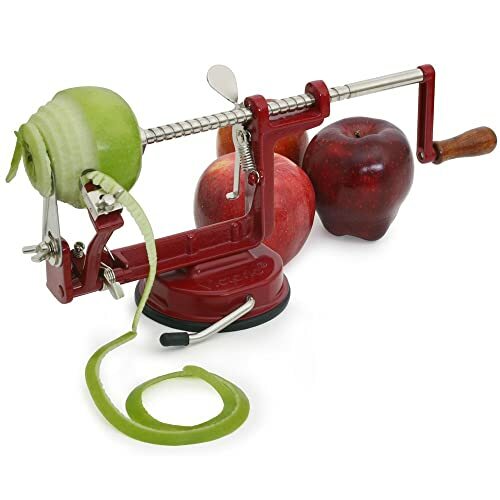 Starfrit’s apple peeler is the only one we’ve tried that has a turntable design. It looks differently, but it does the same thing, it is powered by cranking and it has a suction base. This product is more affordable, and it wastes less apple meat than others. For the money spent on this device, you’ll get a toy-like machine that is specialized for apples and won’t work on any other fruit or vegetable. However, this one’s got a spring loaded arm which adapts to various shapes of apples, so you don’t have to be careful about fruit’s size. It doesn’t have a warranty, but it comes with spare blades. These blades are pretty sharp, and the set includes plastic covers for them. Still, the lack of warranty may be a problem because it has plastic gears and doesn’t seem very durable. The one I’ve tried had a loose handle which is not very safe considering the sharpness of its blades. This one is easy to clean, but you should rinse it right after the use. Apple juice may stick on the inside and make a mess if you don’t do it right away. The handle is loose, may fall off. 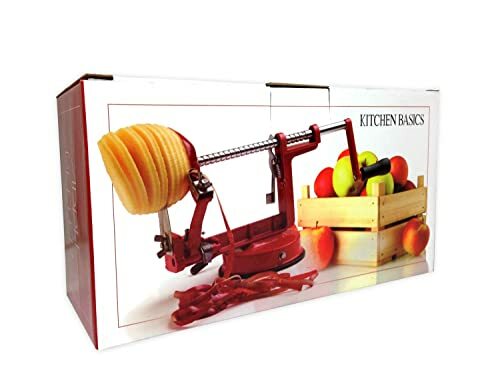 Kitchen Basics’ apple peeler works on apples, potatoes, pears or any fruit and vegetable that is round or oval and have a thin skin. This feature I particularly liked because that is just what I need for fruit carving contest. The amount of money invested in this product will provide you with a solid device which works fine and it is simple to clean, but it is not heavy duty as advertised. Its suction base doesn’t grip well and needs to be adjusted after every few apples. A friend who has this peeler warned me that blades tend to get dull after a month or two. They can be sharpened if you have someone who knows how to do it, but it is an inconvenience whatsoever. The one I’ve tried peeled many apples unevenly. I can’t guarantee that it’s the case with every single product, but you should be aware of that possibility. Instructions may be a little complicated as they have long paragraphs and complex graphs, but once you get it working, it is simple to use, and it does the job pretty fast. Second VICTORIO’s model is the only one that has a clamp base. This means you’ll pay a little more for it, but at least you won’t have to struggle with suction base problems. However, clamp also has its limitations. It is not easy to tighten, and it attaches only on tables and countertops that of a certain thickness. Money invested in this product will get you durable device with cast iron body and stainless steel blades. Also, you’ll get a five-year manufacturer’s warranty which is a huge benefit. The peeler works on apples as well as potatoes and peaches. Still, oversized apples may jam the machine, so you should watch out for these. You’ll get your fruit peeled, cored and sliced in less than ten seconds, without too much meat wasted, which is exactly what I’m looking for. This model, as well as the previous ones, should be hand washed. You should clean it up right away after the use because the fruit’s sweetness tends to make it sticky and hard to clean later. As I need the apple peeler for competition that values precision and speed, I need the one that is fast, doesn’t slip and peels fruits of all shapes and sizes. In my opinion, only one that satisfies all of these criteria is a clamp ﻿﻿based﻿﻿ model of VICTORIO’s Johnny Apple Peeler. I guess I like the old school design the best. On the other hand, if you are buying the apple peeler for making apple pies, apple sauces or something like that, the situation is different. Also, if you have a flat surface to work on, you should consider other peelers I reviewed too. Whichever you choose, just keep on making beautiful and delicious desserts and watch out for your fingers! Great article, as I have zero experience with these peelers. I’m looking to purchase one for my wife, so I now feel a lot better in weighing the pros and cons on these peelers. Thank you!